Our Institute is one of four Cancer Research UK core funded Institutes, receiving £22.9 million a year. This core funding enables the Institute to provide an outstanding environment in which to train and develop scientists. It also allows Group Leaders to expand their teams and research to explore innovative new ideas. 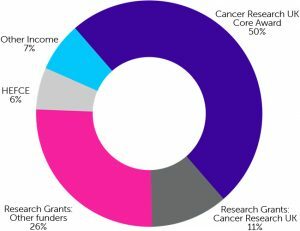 Along with the CRUK core funding, the research in the Institute is funded by a number of organisations. We currently have 158 active research grants at the Institute, with an extra £4.9 million in CRUK research grants and £12 million from various other funding bodies. Infrastructure at the Institute is supported by Higher Education Funding Council for England generated income of £2.9 million. Overall, the total funding of the Cancer Research UK Cambridge Institute for 2018 is £45 million.